Pioneer DJE-1500K Professional in-ear headphones DJParts - All Variety of Parts that DJ Needs. The ultimate solution for travelling DJs has arrived! The DJE-1500 professional in-ear headphones provide powerful and accurate sound reproduction giving DJs the ability to easily prepare sets on smartphones or tablets whilst on the move. These lightweight but durable DJE-1500s are specifically designed to endure the rigors of frequent professional use. A number of soft polyurethane and silicone ear tips are included; They eliminate outside noise so DJs can perfectly monitor the beat – even when sitting next to a jet engine. In turn, the textile-coated, detachable cable is tangle-free and can easily be replaced if it gets damaged, further prolonging the life of the headphones. 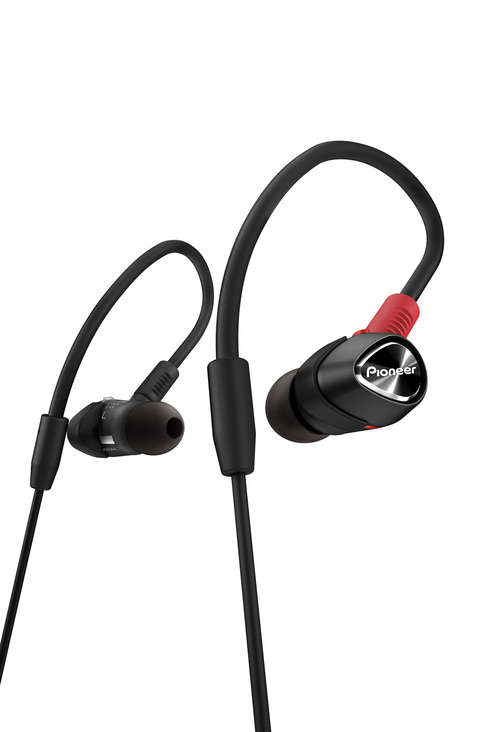 A rotatable earpiece allows you to choose between a secure over-ear and a regular in-ear wearing style. Of course, you can always switch positions for maximum comfort. The DJE-1500’s single dynamic driver has a large 9.4mm aperture that produces deep and rich bass notes, while the copper-clad aluminium wire (CCAW) voice coils and ceramic powder-coated tremblers ensure balanced sound across all frequencies. Professional sound quality is guaranteed!